Your supporters will love you... wherever they go. your brand will always look beautiful on any device. Allow your supporters to signup with ease. Increase fundraiser sign ups and raise more money. Classy gives you a signup process that is designed for the mobile and social era, with your supporters squarely in mind. A beautiful, optimized, cross-device donation form that has proven to increase engagement and donations for thousands of organizations. Classy’s mobile responsive search makes it easy for your supporters (and potential supporters) to find what they’re looking for. With 65% of email getting opened on a mobile phone, this is more important than ever. The most successful businesses on the web have used inbound marketing to convert casual site visitors into valuable customers. 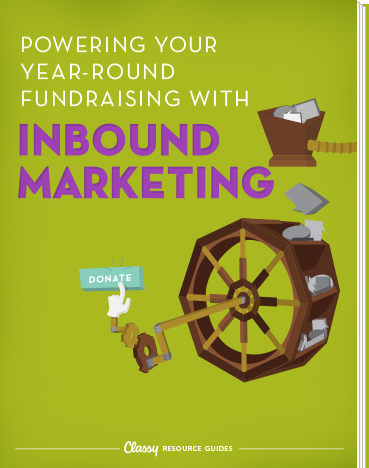 Learn to apply the same proven practices to grow your website traffic, attract new donors and fundraisers that will power your fundraising efforts all year long. Take a look around & always be learning! Industry-leading blog covering all things nonprofits & fundraising. Dive deeper into fundraising topics with our downloadable guides. See how 4,000+ organizations are using the Classy platform. All of our best webinars together and ready for watching. Candid interviews with leading social entrepreneurs and visionaries. Help Center You’ve got questions? We’ve got all the answers in our help center. Contact Us We’d love to hear from you! Click here to email or call us at (619) 961-1892.